The Vekoma Boomerang, thrilling roller coaster best seller: Part 1A of our History of Vekoma. 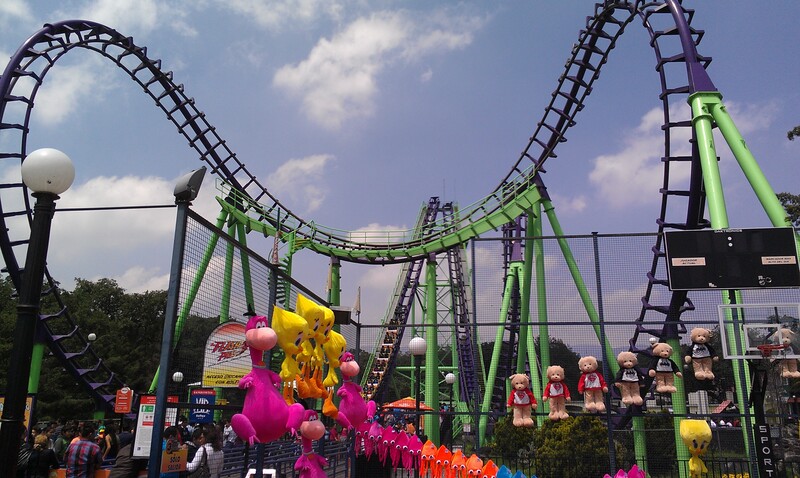 1982 saw the invention of the largest selling roller coaster in the world: The Boomerang. Built originally at Rafaela Padilla (Puebla, Mexico), it did not open until either 1983 or 1984. In 1984, three more models opened, including the number 2 at Bellewaerde Park (Ieper, Belgium) and at La Ronde (Montreal, Quebec) and Morey’s Pier at Mariner’s Landing (Wildwood, NJ). 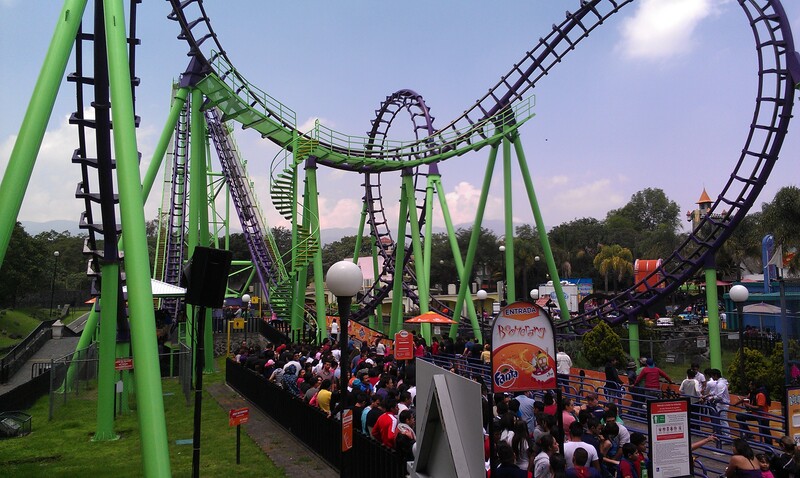 In 1988, the prototype Boomerang was moved to Reino Aventura, now Six Flags Mexico (Ciudad de Mexico, Mexico) where it still operates with the original Arrow train. The original Boomerang in 2013. Costing only 1.5 million USD in 1984 and fitting on a small 289 feet x 98 feet footprint, this innovative ride featured a backward cable lift out of the station. It then goes through the “Boomerang” element that consists of a half loop, a half corkscrew, a half corkscrew sending the train back toward the direction it came in and a half loop. It is today traditionally known as a Cobra Roll. A vertical loop follows and then a traditional chain lift is installed on the second less steep spike. This chain is mounted on hydraulic cylinders and when the ride has reached the height to clear the layout in reverse, the chain turns off and when the forward motion takes the train up, the hydraulics lower the chain, releasing the train backward and into the vertical loop at a slightly slower speed in order to make the trip more enjoyable since riders are in reverse. There are no anti rollbacks on the chain lift and the loud noise when the train attaches to it are from the chain dogs jumping chain links until they are both at the same speed. 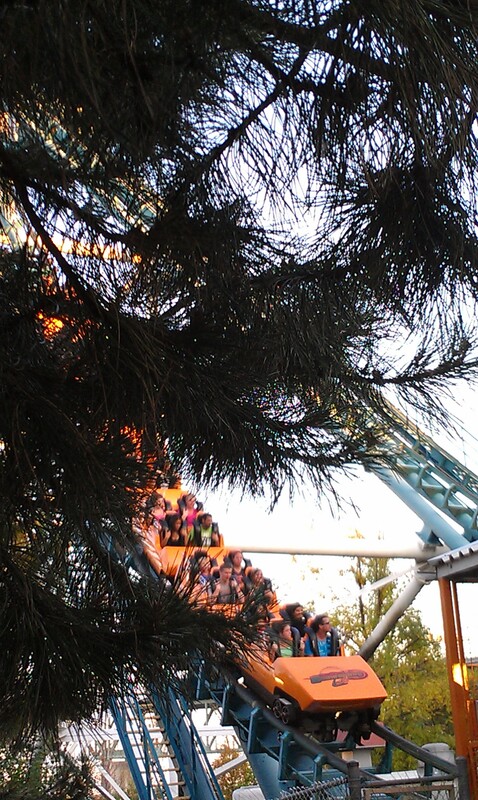 At Walibi Belgium (Wavre, Belgium), the park later modified that chain to have a nylon cache over the lower part, so that the noise is strongly reduced. As part of the safety system to prevent trains from getting stuck in the middle of the Boomerang inversion or in a hard to reach area, safety brakes are mounted at the bottom of the second hill and they close after the train roll over that area. They remain closed until the train has reached the proper height, they reopen and then the train can drop. If the train would drop before, the brakes would slow it down enough that it would not clear the loop and rest where the brakes are. Most parks installed an access platform there to easily evacuate a train from that position. Another modification is the addition of another platform, this time in the middle of the Boomerang loop. A spiral staircase leads up there and so, park workers could safely free trapped riders of a train stuck there. It also add an intimidation aspect, as when the train rolls over that section, the vibration resonates against the welded on platform and creates quite a loud noise. Not all installations featured it, but La Ronde had it when it opened in 1984. 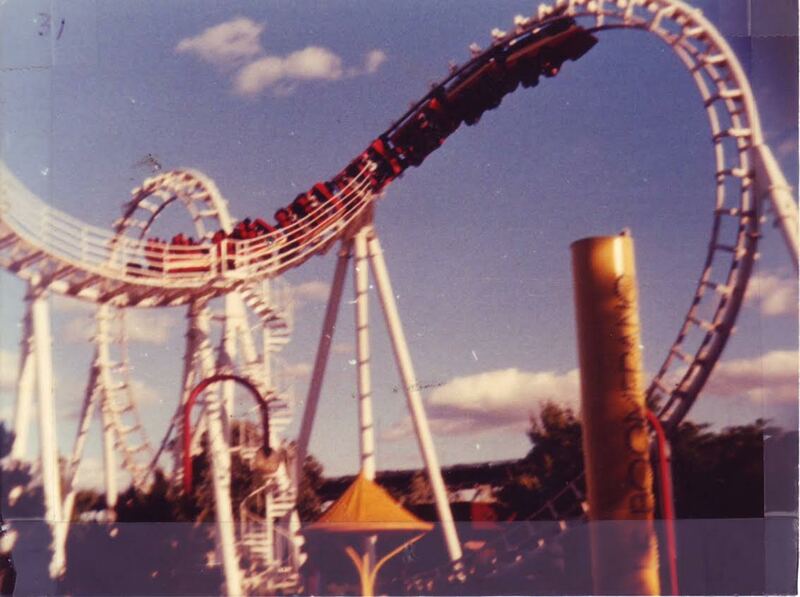 The picture above show the Boomerang in its opening season at La Ronde and appears courtesy of Steve Lecours. The evacuation catwalk in the middle of the Inversions. The cable lift consists of a steel drum that a large steel cable is attached to. The cable runs to the top of the lift and then is attached to a two piece sled. The upper part is a long chariot with 4 running wheels and 4 upstop wheels. There is a pulley on that part and there are two rubber bumpers. A smaller cart is where the cable is attached and there is a hook at the end. The hook is spring loaded and attach to a small steel loop mounted to the back of the last car. The train here consists of 7 4 passengers cars and was a regular Arrow looping train at first. When the train near the top of the lift hill, the brakes in the station and at the bottom of lift 2 open, as the train now would have enough speed to clear the inversions. At the top, a steel piece is mounted and pushes the hook open when the sled reaches it. One notable evolution is moving the drum closer to the station when looking at a late 90’s installation versus the first ones. 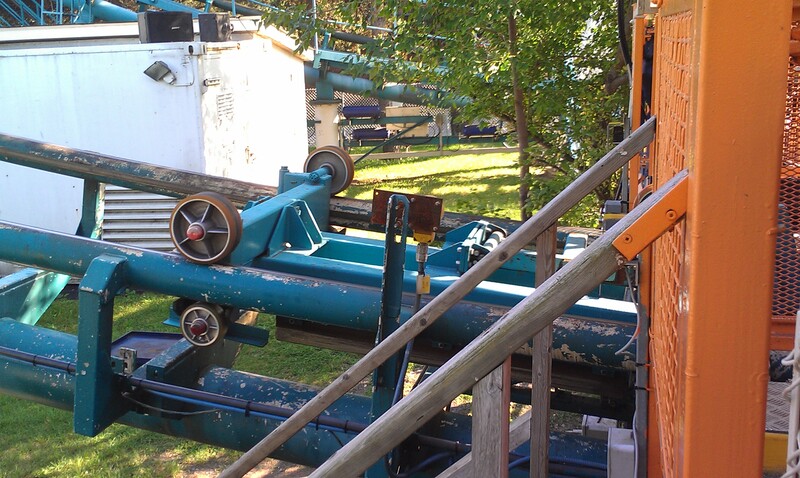 Picture of the sled used on the 1984 Boomerang at La Ronde (Montreal, QC). 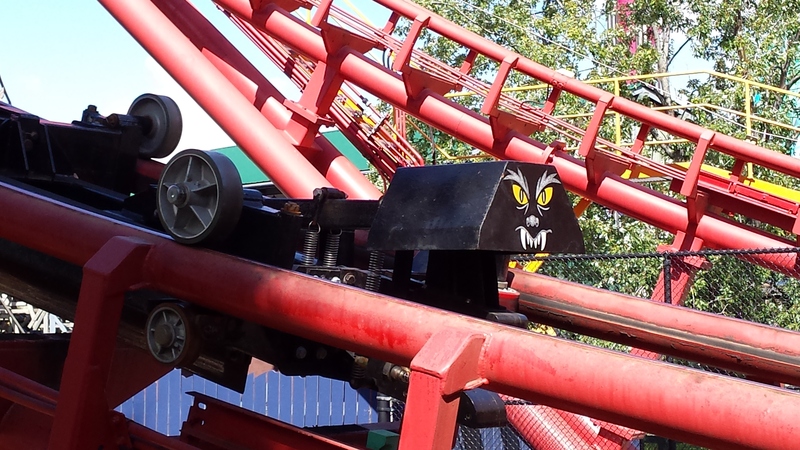 This is the painted catch car on the Bat at Canada’s Wonderland (Vaughan, ON). Thank you to Jordan May for this picture. 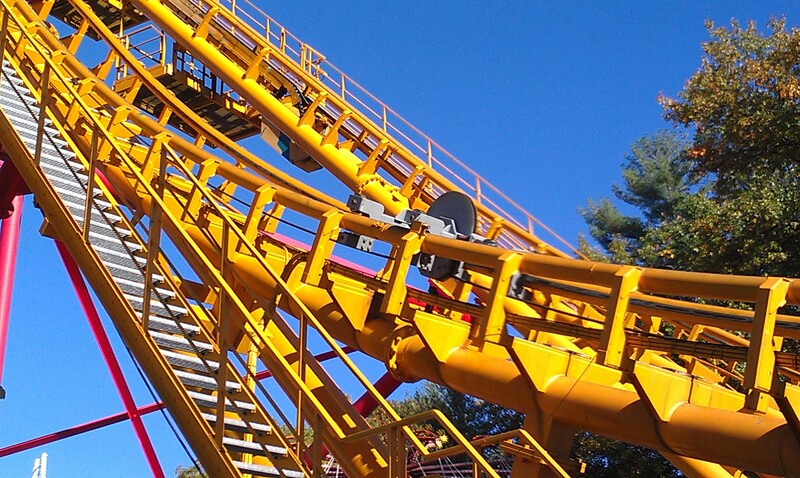 The Boomerang at Six Flags Discovery Kingdom was installed in 1997 also feature a painted catch car; it still sport the “standard” Premier Parks track color. We mention standard as in addition to this installation, the Mind Eraser at Geauga Lake (Aurora, OH, now closed), the Boomerang at Great Escape (Queensbury, NY), the Boomerang at Darien Lake (Darien Center, NY) featured the same track color. For La Ronde, the Boomerang was repainted that color when Six Flags purchased the park in 2001. 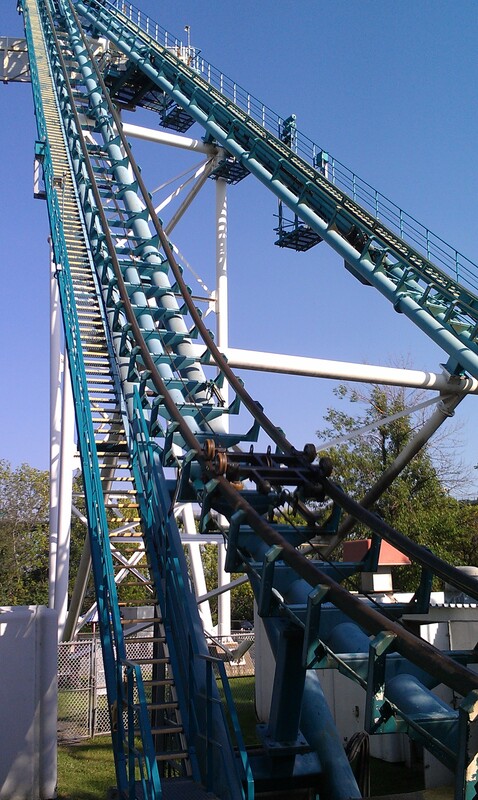 Here is a side view of the double inversion and notice the evacuation catwalk. The classic Arrow train being pulled out of the station. Currently, 50 Boomerangs were sold, operating around the world. 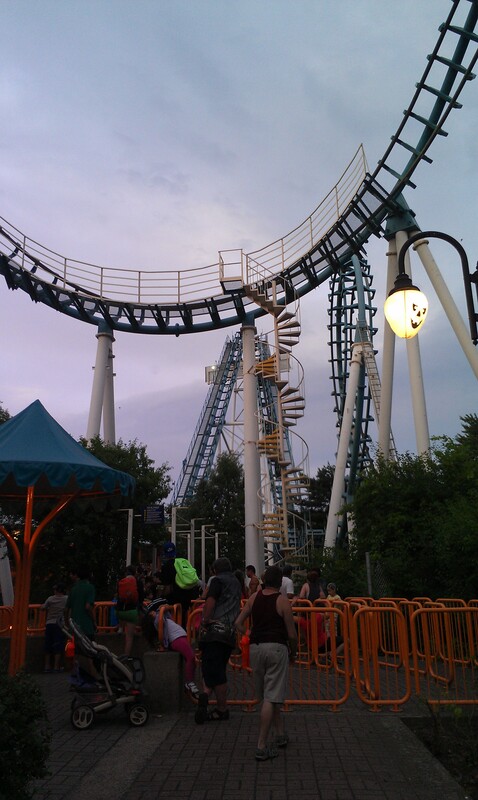 This entry was posted in Coasters, Industry Profile and tagged Boomerang, Great Escape, La Ronde, Six Flags Discovery Kingdom, Six Flags Mexico, Vekoma. Bookmark the permalink. ← Backdraft in Hollywood and Japan: Part 7A of our Fire Series.